ROME, JAN. 17, 2012 (Zenit.org).- Answered by Legionary of Christ Father Edward McNamara, professor of liturgy at the Regina Apostolorum university. A: I was not involved in the translation so, to be quite honest, anything I say will be speculative at best. The new translation of this text is generally more accurate even though in this case the Latin calicem is translated “cup” instead of “chalice” as is done elsewhere in the missal. 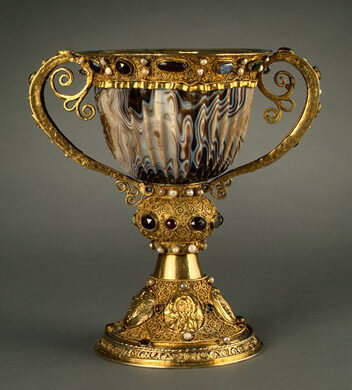 Practically all English-language Bibles translate the Greek poterion as “cup” rather than chalice, as current English attributes a technical meaning to this word which it did not have in the original. In a similar vein the word calicem in Latin can refer to many drinking and cooking vessels and not just those reserved for liturgical use. These memorial acclamations constitute a novelty within the Latin rite, and they were only introduced with the liturgical reform. With the removal of the acclamation “Christ has died …,” which was found only in the English missal, the remaining three are basically scriptural quotes. For this reason I think the translator is justified in following here the commonly accepted biblical translation while translating the same word as “chalice” in the texts that manifest the Church’s 2,000-year development of her liturgical traditions. Although respecting the biblical text is probably the principal reason for retaining “cup,” the translator may also have been influenced by a desire to allow continued use of melodies already well-known by the faithful who often sing this part of the Mass. The addition of an extra syllable would likely make this particular text a bit more difficult to manage. There were several inquiries regarding the crucifix (see Dec. 20). A reader from Zambia asked which direction the figure of Christ should face when the cross is placed upon the altar itself or when the processional cross is used as the altar cross. Answer: In both cases the figure of Christ should face toward the celebrant. This is the current practice for papal Masses in Rome. When there is a large crucifix present behind or suspended above the altar, there is no need for other crosses to be placed upon or near the altar itself. A figure of the Risen Lord or any other similar image of Christ does not substitute the crucifix. The crucifix, however, may adopt any of several historical styles. As well as the more common form of a dying or deceased Christ, it is possible to use an image of the Regal Christ. This image has the Savior with arms outstretched on the cross but alive, fully robed and sometimes wearing a kingly crown as the one who reigns from the cross. According to art historians, this form of representing Christ crucified was quite common until the Middle Ages, when the more dramatic images of the dying Christ became more popular in art and devotion. This question arose with the beginning of Mass facing the people. 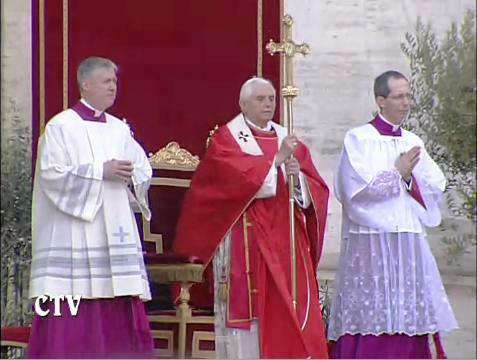 Beforehand, both people and celebrant always faced toward the crucifix. The source for the answer is a clarification published in Latin in the review Notitiae in 1966. Although Notitiae is hard to find, the website www.ipsissima-verba.org has performed an invaluable service in publishing the most important responses and clarifications issued by this review which is the official organ of the Congregation for Divine Worship. Not all of the replies have the same legal force, and some are outdated, but the fact that the material is available on the web saves a lot time in the library.